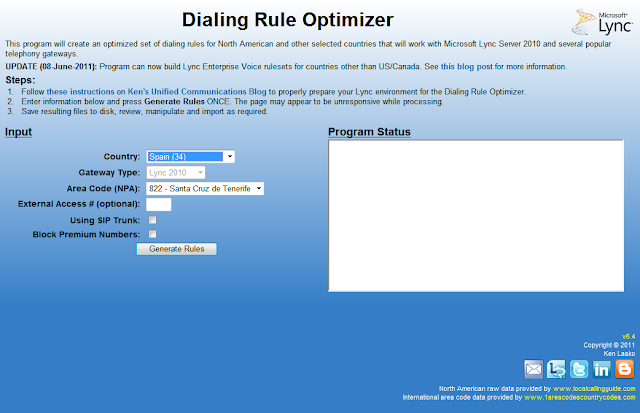 If you've used the Dialing Rule Optimizer, you probably know how easy it makes it to create your North America least-cost routing rules for Lync. After much work, I'm proud to unveil new functionality that will automate the process even more. Originally, the Optimizer created a simple text file that you would copy and paste into Lync Powershell. It would create the phone usage, route and trunk translation rules necessary for least cost routing for a given site. If you input the name or IP address of your PSTN gateway, it would set it in the route, but if not, then the route would not be associated with a gateway. The process was not very tolerant of errors either. If you mistyped the name of the PSTN gateway, much of the script would fail. The original output got you started, but you were still left to your own devices for pretty much everything else. Checks for a PSTN gateway assigned to the site. If one isn't found, the program will quit. Creates a site-level Voice Policy (unless one already exists). Creates standardized site-level normalization rules for local/long distance/international as per my Normalization Best Practices post. 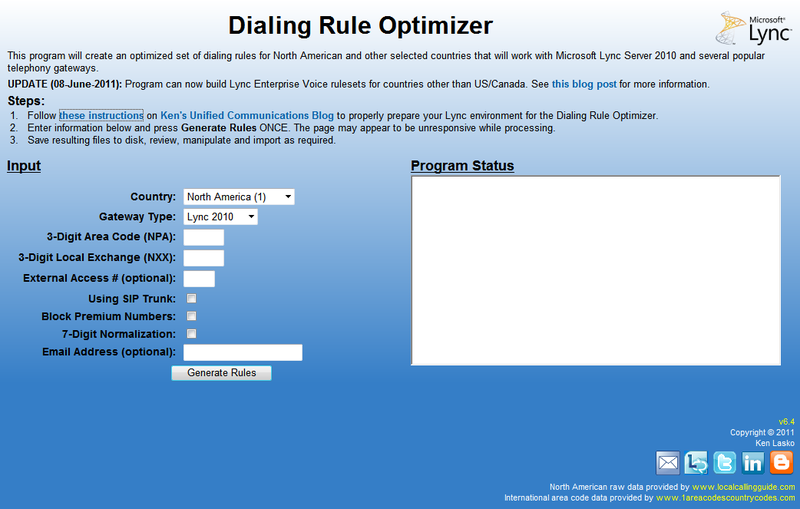 If your site is in Canada, creates normalization rule for 310 toll free calls. Creates separate PSTN Usages for Local, National and International and adds them to the Voice Policy as per my Usages and Routes Best Practices post. 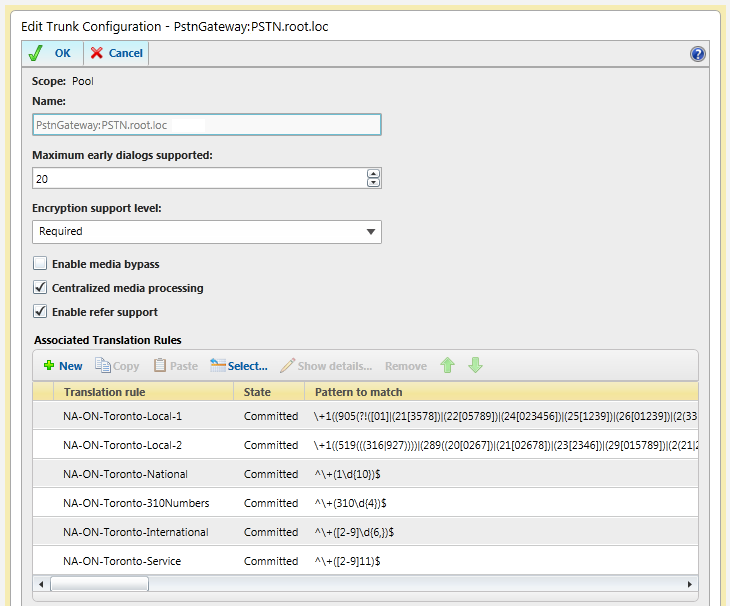 Determines the PSTN gateway associated with the site. If no PSTN gateway is defined in the topology, you'll have to assign the routes and trunk translation rules manually after you set one up. Creates routes for local, national, international, toll-free, and service numbers (411, 911 etc). 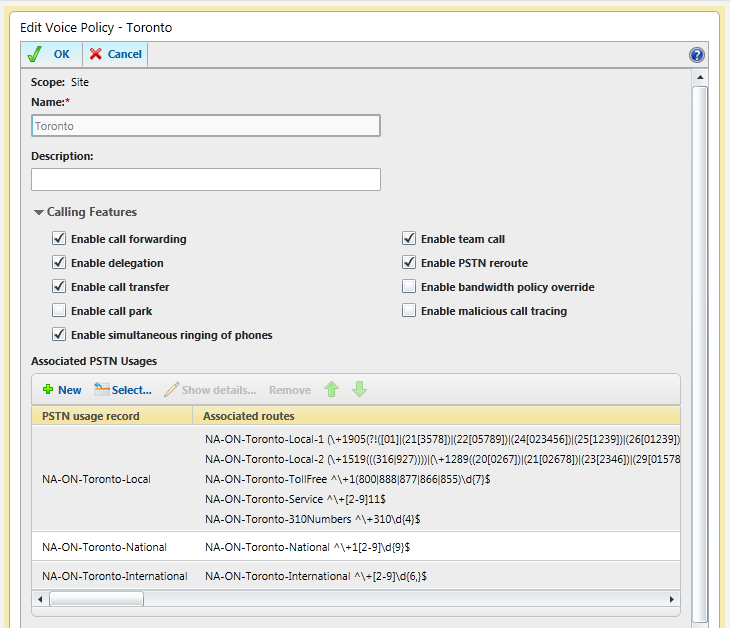 If your site is in Canada, creates an additional route for 310 calls. Assigns those routes to the default PSTN gateway in the site. Creates trunk translation rules for local calls, national and international calls. If you entered an external dialing prefix on the web page, it will take this into account as well. If you select the SIP Trunking option, then the trunk translation rules are not applied. Preparation for the script is also much simpler. All you need to do beforehand to get the most out of the script is to ensure that your sites all have a PSTN gateway assigned. The script looks at the site and will try to apply the routes and translation rules to the default PSTN gateway assigned to that site. If one isn't available, the script will still work, but you will have some manual labour to do afterwards. Pick your country from the drop-down list. Only a few are available now, but more will be added over time. If you have to enter 9 (or some other digit) to get an outside line, enter it in the appropriate box. If you are using a SIP trunk that accepts E.164 phone numbers, select the Using SIP Trunk option. If selected, the program will not create trunk translation rules. All numbers will be sent to the next hop formated as E.164. Note: Don't select both an external access number AND SIP trunk options. The two options are mutually exclusive. If you want Lync to block premium rate phone numbers (like 900 in North America) for all users, select the Block Premium Numbers checkbox. If your North American local dialing area supports 7-digit dialing, select the 7-Digit Normalization checkbox. If you're unsure if your local dialing area supports 7-digit dialing, leave this blank. Doesn't apply to other countries. The program will provide 2 files. The .PS1 file will do almost everything to get you up and running. The .TXT file provides only the least-cost routing rules for North American users, and assumes you will be doing most of the other work. Save the .PS1 file to your Lync server, start up the Lync Management Shell and run the script. You will be prompted for the site to apply the rules to (as below). Select the appropriate site and in a few seconds you'll have all you need to get started. The International Optmizer doesn't have to do the same level of processing that it needs to do for North American numbers. There is a clear deliniation between local and long distance calls, which makes creating rulesets much simpler. Since the dialing rules aren't expected to change over time, you can't enter an email address for non-North American rule updates. Also, since this is designed as a Lync-only feature, you cannot (nor should you need to) create rulesets for the Dialogic or Audiocodes gateways. Run the Optimizer once for each site, and apply the resulting .PS1 file. The finished output should take care of all your basic external dialing scenarios using my best practices as laid out in my Enterprise Voice Best Practices posts. You will just have to add normalization/routing rules for internal use as you see fit. 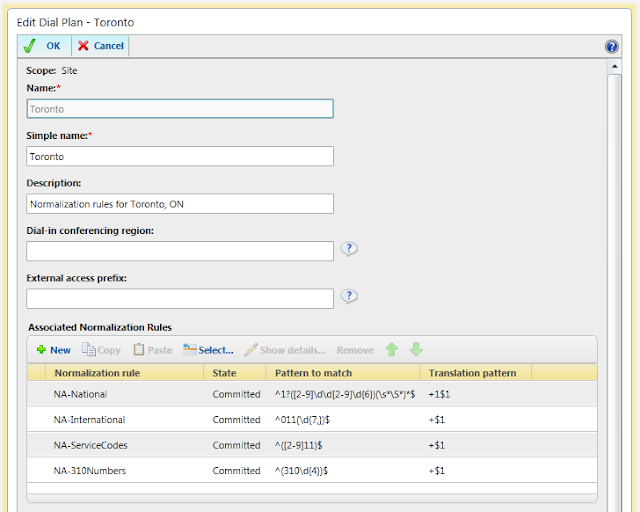 Below are some screenshots of what a virgin, never-touched Lync Enterprise Voice implementation will look like after applying the script (this example uses Toronto as the location). The blocked premium number list is customized for each country. The actual announcement can be customized either by using text-to-speech or audio files. See this blog post for more information. 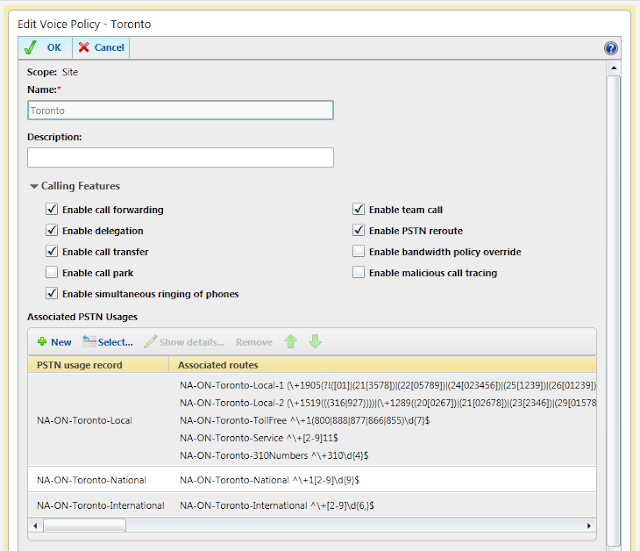 To provide failover and least cost routes for multiple sites, simply add the appropriate PSTN usages to your Voice Policies as desired. Use this post as a guide for how to provide least-cost and failover routing between multiple sites. If you still prefer to do things manually, or you already have a voice deployment you're happy with, the original script format is still included as a .txt file. It will create the bare minimum PSTN usages and routes for least-cost routing. I hope you find this useful. Please let me know if you have any problems or questions. If you find a bug in the script, PLEASE let me know so I can fix it. In E.164 Formatting﻿, I briefly touched on how to manage extensions for companies that don't use Direct Inward Dialing (DID) numbers for their users. DIDs are usually known as "direct numbers", where you don't have to dial a central number to speak to a receptionist (or auto-attendant) to reach your target user. For cost, business or technical reasons, a company may not use DIDs for their internal users. Instead, they assign everyone an extension off a main office number. For outbound calling, the PSTN likely won't recognize the ;ext= format in the user's Caller ID and may default to show the main office number, but if it doesn't work, you can always use the Alternate caller ID in a route to make sure the main office number is sent as the Caller ID. One thing to stress is that you cannot use the office number alone for any purpose in Lync if you've used that number for your extensions. If you're using +14163334444;ext=3xxx for your users, you cannot use +14163334444 by itself for your Exchange auto-attendant or Response Group. If you try this, all inbound calls will fail with an error along the lines of "485 Ambiguous". If you find yourself in a situation where you are getting "485 Ambiguous", try using Tom Arbuthnot's Get-LyncNumberAssignment script that will help locate any rouge numbers that may be assigned to UM, common area phones etc. If you've set up extension dialing and are getting the dreaded "485 Ambiguous" when trying to reach someone, its likely because you have defined your office number somewhere without an extension. All calls coming into the main office number should be automatically routed to the appropriate auto-attendant/response group. In conclusion, I hope this post answers a lot of the questions that come up with how to best handle extensions in Lync. While there is nothing stopping you from assigning just the extension to the user, I truly believe that starting off with a consistent deployment around E.164 will make your life easier and will help prevent issues down the road. This only occurs in situations where incoming calls are prepended with a plus sign. This will typically occur when using SIP providers or PSTN gateways (AudioCodes, Dialogic etc) that prefix incoming calls with a +. Create an MSPL script to forward the incoming number to the autoattendant directly. I've confirmed this is the expected behaviour for Lync. I've made my case to the right people, so maybe we'll see a change in the future. It's been quite a while since I've blogged about Lync. I've been a very busy boy trying to finish renovating my basement before the weather turns too nice to be stuck indoors. Thankfully, the crappiest spring I can remember has allowed me to get a lot done. Between that and my day job, it hasn't left me with much free time or energy to blog. Last night, I was helping a client complete their migration from a legacy PBX to Lync Enterprise Voice. Their receptionist was going to use the Lync Attendant Console to manage incoming calls via a simple Response Group. Since there were a few people who rotated into the receptionist role throughout the day, we needed a simple way to ensure that calls would only go to the person currently on reception duties.